Even in standard form, the system carries a set of tools to produce creative visual setups quickly and easily. 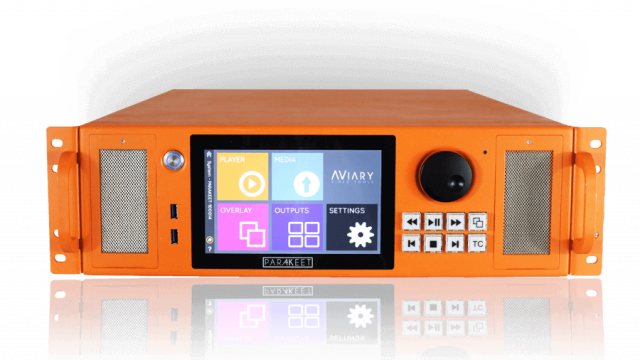 Logo overlay, in/out points, and integration with protocols such as SMPTE and TCP/IP can be deployed and programmed easily from within the unit’s intuitive users interface removing the need for additional processing equipment or return visits to an edit suite. Comprehensive output mapping tools brings much of the functionality found in video wall controllers inside the source machine removing the need for third party processors and enabling super-creative display layouts even with semi-professional and domestic grade screens. Full compensation for canvases comprising devices with varying resolutions, free-form spacing and arbitrary rotation of any or all intuitively from Par4Keet’s front panel or accompanying software.